The date and time shown are for Day 1 of the 3 day class. Day 2 meets on October 27 from 10:00 a.m.–noon. Day 3 meets on October 28 from noon–2 o’clock. Please note the information for all 3 days on your calendar. Master Woodworker Dave Rasmussen will guide you as you select your wood and glue it for finishing into a straight stick cutting board on Friday. 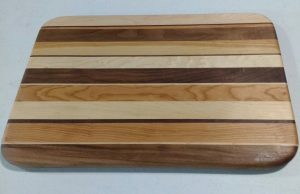 Sand and router your cutting board and finish the straight stick design on Saturday. Complete the chevron pattern shown on Sunday at no extra fee. Any routers, palm and belt sanders brought by students will speed up the process and slow down the wait times for shared equipment. The cost covers all three days of the class.